Split a list by filtering on configurable conditions. 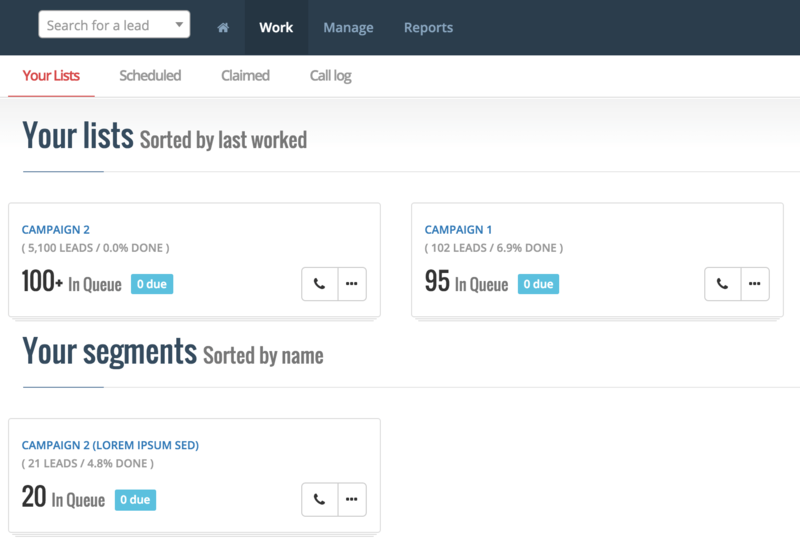 In myphoner, a List is where your leads belong. A Segment on the other hand, is just like a filter, selecting a subset of the list based on certain conditions. Reports will show activity on the underlying lists, not on segments. Segments cannot be configured other than the conditions they hold. They inherit their configuration from the list. Access segments from the list configuration page. Segments have users associated independently of lists, so when creating the segment, you get to choose what users can work on it. One of the benefits of this, is that you can remove the user access from the underlying list, and just have your agents work just on the segments you define for that list. The segmenting conditions is the very core of this whole exercise. We've done our best to help you on the way. Chose what field you want to segment on, and then specify your condition. There's a few options depending on what data type the field has. Type in the first few letters and myphoner will get all the values that exist for that field and let you choose one. Currently we only do exact matches on text type data. If you have fields in your list that is configured as being boolean, then you can segment based on whether those are true, false or not yet set. This can be convenient for segmenting based on criteria such as receives newsletter? or other yes/no conditions. If you have fields in your list that is configured as being integers, then you can segment based on whether those are equal to, greater than or less than a certain number. This can be convenient for segmenting based on number of employees or similar. Pro Tip: Segment to a range by using two conditions - one greater than and the other less than. Remember that greater than 21999 will include 22000 in the range, but not 21999. You can add multiple conditions. All conditions on distinct fields will be applied to the segment with AND. Multiple conditions on the same field will be applied with OR so you can have one segment that matches City One OR City Two AND receives newsletter. Choosing the scope of a segment. Next to the creation form you'll see a preview much like the one you see in the list configuration. 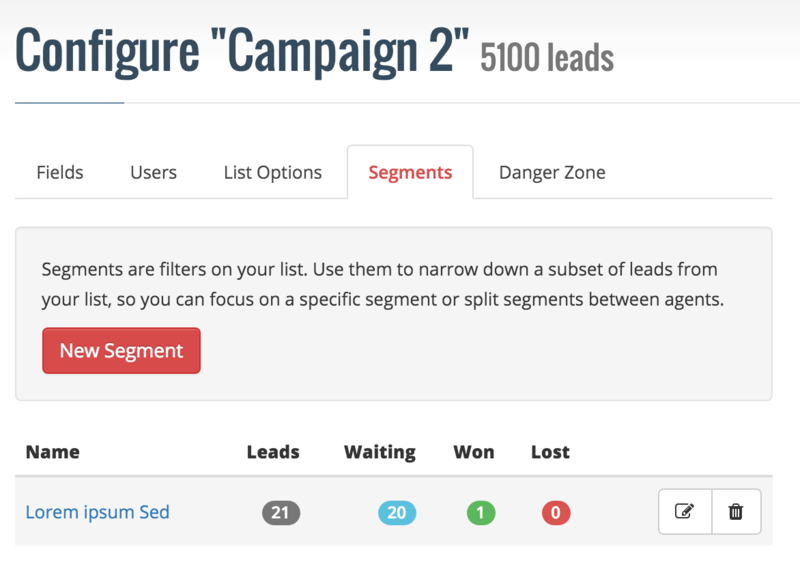 Here you'll find information about how many leads matches the current conditions you've set up for your segment, and you can preview the leads currently part of the segment. The preview is automatically updated everytime you change the conditions, you do not need to do anything for it to be accurate. 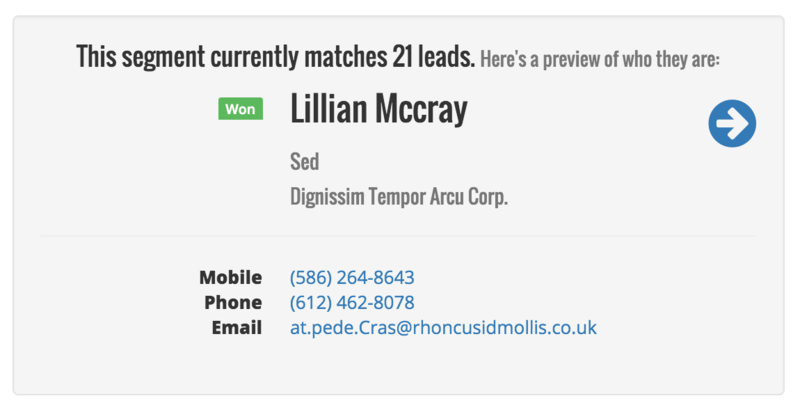 When creating a segment, you get to preview the leads matching your segmentation conditions. The rest is easy. When you are confident that segment is done, just hit theCreate button. 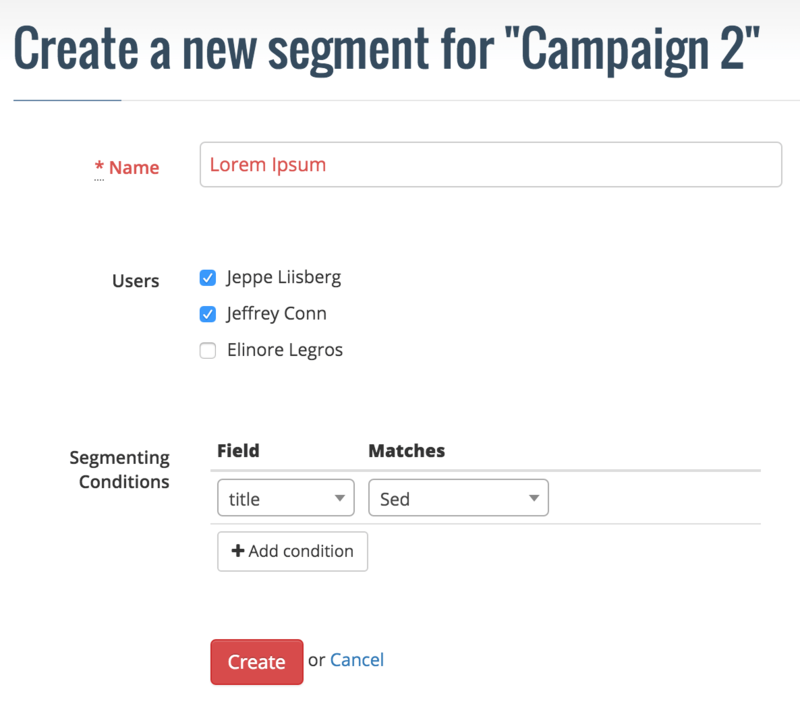 Now you can create more segments, or start working your newly created segment. Segments will appear in the work dashboard under Call Queues for each of the agents you have assigned to that segment. Viewing work dashboard for an agent with a segment.